I recently discovered that if receive photos from my Skype account, I just right click the photo, click on ‘copy’, open my email, click on compose, then Paste the photo as a message to myself. When I retrieve the message in my email, I just open that message with the photo as the content, right click on the photo and click on ‘copy image address’ then do the usual uploading in BLF, which saves me a lot of key strokes than before (the Imgur way). However, while in my pc/Android/IOS I can view the photos normally, some people say they can’t view the photos, so I have to edit the post and use one more step, and that is, through IMGUR, which I want to avoid to save time and effort. Would anyone know the reason why? In the photo above, I can view it in my pc, Android and IOS phone. I don't see the photo. Sorry, already a senior guy so please bear with me on this one…clear the cache where or of my what? Ok, managed to research on how to ‘clear the cache’ and did it. Below is the same way the photo was uploaded as described in my op but somehow some people cannot view it. For you guys who said earlier you cannot see the photo, can you view it now? Try opening the thread in an incognito window – it sounds like as it’s accessing the image, it’s doing background authentication. You can see it because you’re authenticated, but nobody else can. Realistically, imgur (and other options) is probably the quickest option. Chrome has a “re-host on imgur” extension, so you can right-click any image you see in Chrome and it’ll re-upload it, then you can just copy/paste the imgur link. Can you view the photo this time? I was more meaning – open this thread in an incognito window (a new one), so it won’t have any of your authentication. Or, better yet, another web browser that you haven’t logged into your email with – that takes anything “saved” out of the equation. I do that with Safari usually; that’s my go-to on “blank slate” browsing if I need it, as I mainly use Chrome. Yes, the photo was copied from my Skype account and pasted as a message to my inbox…you are probably right…you don’t have permission on that, that’s why only I can view it. While it saves me a lot a key strokes, now I know others cannot view it. I wonder if there is another way to do and view it without going through Imgur? You are trying to link to content within your personal email account. That is private content which only you can access, for obvious reasons. That is why you need imgur. By uploading to imgur, you are making this content public so others can access it. I thought I was able to find a new, easier and faster way to post photos from my Skype to our forum! 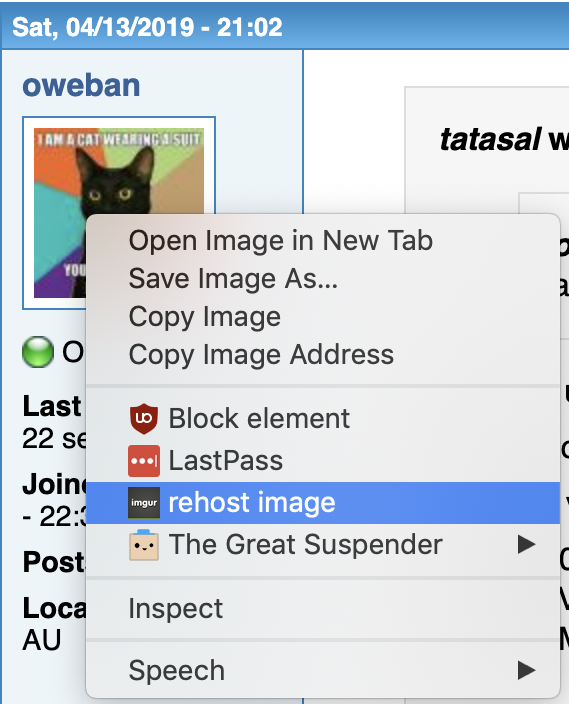 The extension I linked earlier makes it super simple – rightclick the image, and then choose Rehost Image – it then pops open a new tab with the image, so you can copy/paste the link. The only thing that would make it smoother is if it auto-copied, but that might be a bit beyond what can be done. But as you’ve said – from Skype to image hosting to forums… There’s probably a way to do it with shared Google Drive folders etc, but I think it’d still require a bit of fiddling.